I have four kids and we all love building with LEGO bricks. Well, the older ones love creating, the younger ones love demolishing. So we live in this constant state of creative tension. At 8 and a half, my eldest, Phoenix has had to come up with inventive locations to display his masterpieces high up so that the little ones can’t reach them. So the day Build with Chrome launched recently, I knew we’d have to explore it together. I could see Phoenix’s mind turning over: trillions of LEGO bricks in the Chrome browser = dream building opportunity that no one can destroy! I asked him what he would build if he could build anything at all - and together we created Phoenix’s Dream Treehouse. He put it on the map, on his own private island (nice touch), around the corner from our actual house. It’s Father’s Day on Sunday. I’ll be celebrating at home with my four kids building more dream treehouses. My version though is going to have an elevator for when their Mum and I can’t quite climb that ladder any longer. Your dad probably gave you your first LEGO set, so why not return the favour this Father’s Day. Share Build with Chrome with him before Sunday and see what he builds. We’ve all seen the headlines about Perth being the centre of the mining boom. With an abundance of iron ore and other minerals on its doorstep, the Western Australian capital has been shaped by Australia’s natural resources. But lesser known is that Perth is now at the centre of another boom: the digital boom. Today, we’ve announced the City of Perth as Australia’s top eTown. 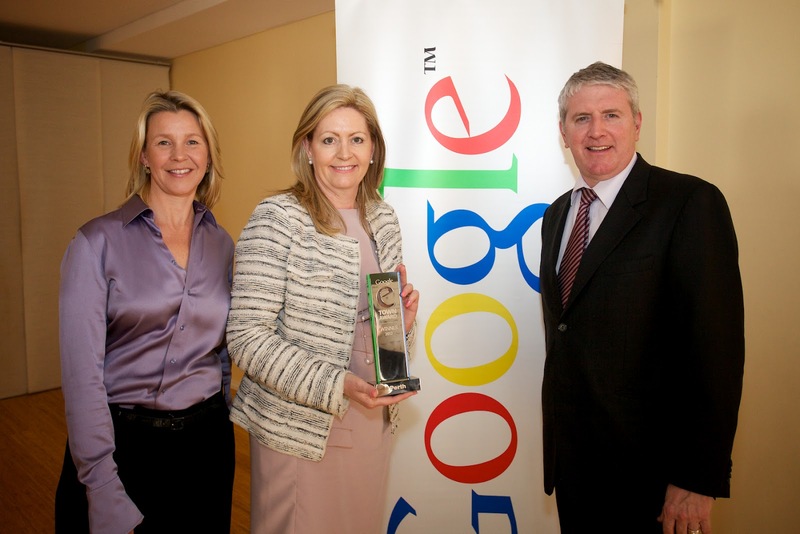 This new Google award recognises and ranks those communities which are outpacing the rest of the country in having its small businesses use the web to connect with customers and grow. The web is transforming all businesses in Australia, not just those typically considered to be “Internet businesses”. The digital economy is already worth as much as Australia’s iron ore exports, according to Deloitte Access Economics, and it’s forecast to grow by $20 billion to $70 billion by 2016. To provide a snapshot of this vital economic activity, Google looked at more than 600 local government areas to analyse which communities had the highest proportion of small businesses who are either using Google AdWords to find customers, or have created a website using the free Getting Aussie Business Online tool. Taking into account relative population, we’ve identified 10 eTowns whose businesses are leading the way in this digital boom. The Yoga Space, located within Australia’s top eTown, is using the web to connect with new and existing customers. Business owners Jean and Rob have a great website which helps you find basic information like their address and phone number. And when they have a new class or special retreat, Jean and Rob turns on an online advertising campaign to help fill their spaces. They can then turn it off as soon as they’re full. The web has made it a lot easier for Jean and Rob to find the busy mum in the suburbs or the fly-in-fly-out miner looking for that inner balance. Unlike the mining boom, geography doesn’t matter when it comes to taking part in the digital economy. Whether you’re located a big city like North Sydney or in the rural villages of The Scenic Rim in Queensland, the internet is empowering businesses everywhere as the entire world becomes your local market. You can also see the full-list of winners on an interactive map here, as well as find stories about Aussie businesses succeeding online and driving our economic growth. Last week Woolworths Limited equipped their 890 Supermarket Store Managers with the mobility iPads provide. Our managers can now stay abreast of administrative tasks while still maintaining their shop floor presence and focusing on their customers. The mobility has been further bolstered with the collaborative power of Google Apps for Business, as each Woolworths Manager now has a Gmail account. We also added a custom-made application, Tap for Support, which is built on Google App Engine. Tap for Support is a one-click app that allows staff to log a support ticket with Woolworths HQ. In an instant, a Manager can log a support request for example to fix a faulty freezer and get back to the multitude of other tasks at hand. Tap for Support not only streamlines administrative functions, it also enables our Managers to do it on the move. Having Tap for Support running on Google App Engine means we leverage Google’s infrastructure, not just to host and store the app, but to build it as well. This removes many layers of complexity, and the simple licensing on consumption structure means it can scale very quickly when we need it to. It was very important that we picked something that was totally easy to use and most people are familiar with the intuitive nature of Google from their personal lives. As Google is cloud-based and device agnostic, it enables us to work the system across our existing and future IT infrastructure. introduced cycling paths and directions in Australia for desktop Google Maps, and today we’re making cycling easier and even more accessible by adding turn-by-turn directions and voice-guided biking navigation to mobile devices with Google Maps for Android. With biking navigation, you can simply mount your device on your handlebars to see which way to go or put in your earbuds to hear voice-guided directions. The navigation even helps you avoid steep hills by choosing a path that is flat and safe. You can also help out your fellow riders by adding your favourite bike lanes, trails and suggested routes to Map Maker, helping to create a more comprehensive map for everyone living in or visiting your neighbourhood. We hope that biking navigation makes it easier for you to get outdoors and explore more of Australia. Whether you’re a seasoned rider or a casual fixie commuter, finding the best biking routes can often be a challenge. Back in July, we introduced cycling paths and directions in Australia for desktop Google Maps, and today we’re making cycling easier and even more accessible by adding turn-by-turn directions and voice-guided biking navigation to mobile devices with Google Maps for Android. Last year a group of Google employees began a series training session for non-profits. The aim was to show how the web - and Google’s products and technologies - can help these important organisations better reach their goals. So far we’ve run training sessions in Melbourne, Canberra, Brisbane and Parkes. We’ve talked to hundreds of people from the non-profit sector about how tools like YouTube, Google Apps and Google Earth can be used to make collaboration easier, cut costs and help their operations run more efficiently. Through these Google for Non-Profits sessions, we've noticed that demand for this type of information has been high. When we announced our first session, more than 400 organisations registered in the space of 48 hours. We also know there are many rural and regional organisations (often the ones who have the most to gain by embracing technology), who have not been able to travel to attend these workshops. That’s why we’ve decided to bring our Google for Non-profit training directly to you via Google+ Hangouts. With these hangouts, anyone anywhere can watch and take part. Our first Google+ Hangout for Australian Non-Profits will run on October 4th at 2:00pm. The ninety minute session will provide a broad overview of the Google products most useful to non-profits, as well as information about the specific grants and programs that are available. The hangout is aimed at leaders within these organisations - not necessarily the technical folk - who are interested in learning more about how Google tools could be used to help fulfil their objectives. To register for the Google for Non-Profits Hangout and to share the event invite, click here. The Google Sydney offices recently played host to a Girl Geek Dinner, a networking event that allows women who are passionate about tech to meet each other, hear about new ideas and generally to geek out together. These dinners first began in London in 2005, when software engineer Sarah Blow got fed up attending tech events as one of only a handful of women. So rare, in fact, that others present assumed she couldn’t have been an engineer. So after brainstorming on the train home one night, Girl Geek Dinners was born. Since its humble beginnings, Girl Geek Dinner groups have opened up all over the world including the United States, South Africa and Croatia. The recent Sydney dinner saw more than 75 attend, and aside from everyone receiving the popular squishable Android plushie as a take-home gift, there was a series of useful tech-talks. For example, the event’s keynote speaker Sasha Bermeister spoke about the Twitter Bootstrap framework, telling us what it is, how it works and, in her own words, “why it’s so awesome”. She took us through some of the more compelling features and showed us how easy it was to get a responsive website up and running in no time. Googler Grace Chung spoke and demoed Google's Knowledge Graph, and Nicky Ringland talked about attracting high school students, particularly girls, into computer science through the NCSS Challenge. Silvia Pfeiffer covered how next-generation browser technology and HTML5 can enable plugin-less videoconferencing. For something different, Kris Howard revealed the science of knitting geekery and how technology is being used to solve the first-world problem of using your smartphone’s touchscreen while wearing gloves. Girl Geek Dinners continue to grow here in Australia with groups springing up in Adelaide, Brisbane, Canberra, Melbourne, and Perth. For more information about future Girl Geek Sydney meetups, you can sign up here as well as follow @GGDSydney on Twitter. Catholic Education Network (CEnet) takes to the cloud! The Catholic Education Network (CEnet) provides and manages shared IT systems for over 300,000 students and 30,000 teachers and staff throughout Australia. Our users are spread across more than 740 sites in metropolitan, regional and rural areas of NSW, Queensland, Northern Territory and the ACT. CEnet’s members wanted to move to a next-generation messaging and collaboration platform that went beyond the realms of just plain old email. We have always been aware of the challenges involved in deploying services on a grand scale – IT in education is a big operation that is often underestimated. Naturally, maintaining systems of this scale requires a significant investment in time, cost and effort. The need to apply regular updates and patches, manage storage, plan for capacity and maintain individual staff and student access was something we dealt with on a day-to-day basis and something we believed was far more complex than it really needed to be. Working with our members, we decided to look for a solution that would establish a centralised resource for communication and collaboration and ultimately reduce the risk and cost of our on-premise services. Importantly, any solution needed to be aligned with a virtual learning environment paradigm that would evolve to support the learning initiatives of our members. It also needed to accommodate the expectations of the highly tech savvy generation Y and Z students who expect the same level of technology access in the classroom as they have at home. In the end, we selected Google Apps; its cost effectiveness, time-to-deploy and inherent capabilities were the key drivers behind the decision. The cloud computing solution lowers our management overheads, maintenance costs and effort. Importantly the functionality of Google Apps’ is also valuable and we can, and have, readily extended the system by utilising the Google Apps Marketplace. We also have the assurance that we’re staying in touch with the most up-to-date technology and meeting the needs and expectations of our students. As Google is constantly innovating, so are we. The initial rollout of Google Apps took only two weeks, a record in terms of delivering a platform of this scale- 330,000 users across our network. Our staff and students have the full suite of Google Apps at their fingertips: Gmail, Google Drive, Google Sites, Google Groups and Google’s email content filtering capabilities. We are already seeing that Google Talk for instant messaging is becoming a popular way for staff and students to interact. The biggest benefit of Google Apps is the ability for our staff and students to share their ideas through a power-to-the-user philosophy. This is very different to the way we have operated in the past. Google Drive is now serving as a central resource for file storage, enabling planning and collaboration for both staff and students. This in itself makes group work for students easier, as they can create and edit their work wherever they are and the one central document is updated in real-time. As the IT managers and service providers, we have reduced the number of physical servers or virtual machines from over 30 to just the four. The whole IT ecosystem requires far less maintenance and the constant innovations and upgrades from Google do not require patches or hands-on IT staff time. CEnet, like the community it serves, is constantly changing. 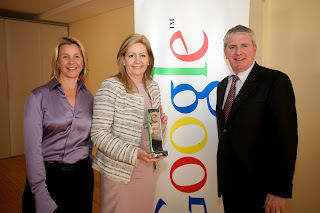 We are delighted with the benefits our decision has delivered already and know Google Apps will evolve as we do. We hope this added intelligence will give you a more complete picture of your interest, provide smarter search results, and pique your curiosity on new topics. We’re proud of our first baby step—the Knowledge Graph—which will enable us to make search more intelligent, moving us closer to the "Star Trek computer" that I've always dreamt of building. Enjoy your lifelong journey of discovery, made easier by Google Search, so you can spend less time searching and more time doing what you love. Editor's note: Originally cross-posted on the Inside Search Blog on May 17, 2012. 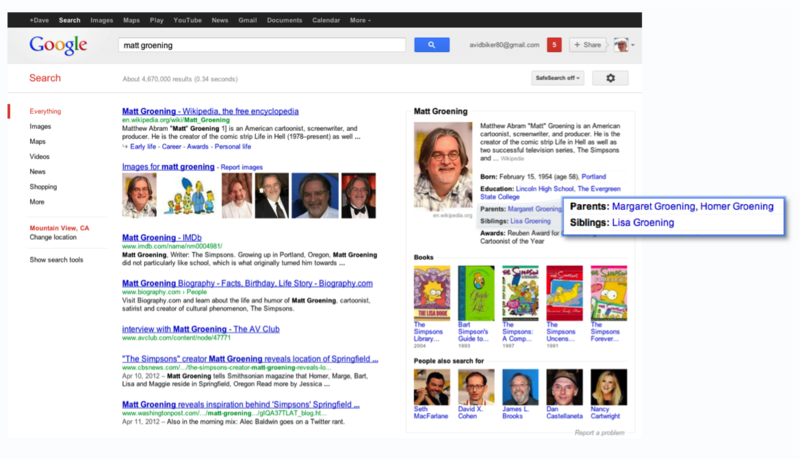 Knowledge Graph results are now available in Australia for English language searches. Try a search like [Sydney Opera House] or [AC/DC] or [cloudstreet]. 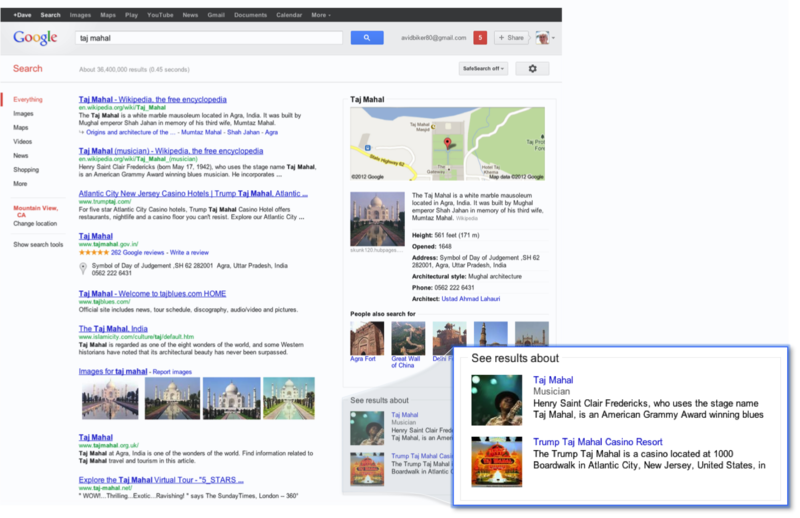 This is one way the Knowledge Graph makes Google Search more intelligent—your results are more relevant because we understand these entities, and the nuances in their meaning, the way you do. We’ve always believed that the perfect search engine should understand exactly what you mean and give you back exactly what you want. And we can now sometimes help answer your next question before you’ve asked it, because the facts we show are informed by what other people have searched for. For example, the information we show for Tom Cruise answers 37 percent of next queries that people ask about him. In fact, some of the most serendipitous discoveries I’ve made using the Knowledge Graph are through the magical “People also search for” feature. One of my favorite books is The White Tiger, the debut novel by Aravind Adiga, which won the prestigious Man Booker Prize. Using the Knowledge Graph, I discovered three other books that had won the same prize and one that won the Pulitzer. I can tell you, this suggestion was spot on! At the 2012 Olympics we’re seeing new records set everyday, not only in athletic performance, but also in global search behavior. It's clear that these are the first multi-screen Olympics, as users are engaging across TV, computers, smartphones and tablets, often at the same time! And as users watch TV, or watch their laptops at work, they're searching for information about athletes, sports, events and records - on their tablets and smartphones. In fact, at some moments during the Games, there have been more searches performed on tablets and smartphones than on computers. We’ve seen large spikes in global mobile search volume during recent major sporting events, like the Super Bowl, and the Olympics certainly continued this trend - in its first week, Olympics related searches on mobile devices (smartphones and tablets) grew by 10x from the previous week. We’ve crunched some data from the past week, and the opening ceremony is a great illustration of how mobile devices have taken center stage. Fans turned to their smartphones and tablets to find more information about the incredible feats and celebrities that they saw on screen. Below is one such example where searches for Paul McCartney surge in line with his performance of Hey Jude at the end of the opening ceremony. Whether watching the Olympics at home on TV or on a desktop livestream, or at a bar with friends, users searched on one screen for things they saw happening on another screen. Comparing searches by device type, smartphone searches surged, and in the US, viewers were searching almost as much on their tablets as on their computers for Paul McCartney. The infographic below gives a snapshot of the percentage of total searches that occurred on smartphones and tablets during the first two days of the Games, for Olympics-related searches. We see these trends in many multi-screen events (such as the Super Bowl, Oscars, and Eurovision) but the Olympics represents an even more pronounced trend and one we can see happening at a global level. European countries showed especially high mobile search volume with most countries having one-third or more of their Olympics-related searches occurring on a tablet or smartphone. In some European countries this number was substantially higher - in the UK, 46% of Olympics searches happened on mobile. In Asia, South Korea (36%) and Australia (45%) saw mobile search volume spikes, while Japan (55%) was at the front of the pack. As we examined global Olympics search share we noticed an interesting pattern emerge from island nations. On many of the islands that serve as popular tourist destinations, tablet search share was almost equal to smartphone, or in some cases even exceeded it. This is different from most other countries where smartphone search share is typically significantly higher than tablet. A possible explanation? Large numbers of tablet-toting tourists on summer vacation. Tablets have emerged as an important way of staying informed and connected for travelers, as well as for finding local information. Olympic fever is a global phenomenon, and mobile searches are letting everyone get immediate information, in real time, about what’s happening moment by moment. We hope to have more insights into how people are using their mobile devices during the Games! google.com.au/olympics. Here’s a quick look at the updates, results and other content we’re bringing you from London 2012. Search from your desktop, phone or tablet for [london 2012], a country team like [Team AU], or a sport like [archery], and you’ll see up-to-the-minute detailed information. On Google Play, find a collection of useful apps, including the Official Australian Olympic Team app, for download on your Android device. The Olympic Games are well underway and more than half the planet—some 4.8 billion people—will tune in to watch. To help you join in the excitement and glory of the Games, we’ve put together google.com.au/olympics. Here’s a quick look at the updates, results and other content we’re bringing you from London 2012. The topic of user adoption was the focus of our second Google Sudo, a series of panels and workshops designed to help Aussie entrepreneurs. More than 170 entrepreneurs joined our event in Sydney (and many more via our Hangout on Air) to hear about how they too could scale their internet businesses and drive user adoption. After a lively audience discussion on questions ranging from how to get your very first customer, to how much emphasis to put on marketing, to the merits of the “freemium model” we asked our panelists for their top tips on driving user adoption. Mike Cannon-Brookes, CEO and co-founder of Atlassian advised the audience to “engineer your growth”. He stressed the importance of understanding how one user or customer leads to another. Similarly our own Stuart McLean, Head of Google Enterprise for Australia and New Zealand (and former founder of NetReturn) spoke about the importance of having the customer be your best salesperson. “Make sure customer number one will sing your praises. Get them to help you get your next 10 customers”. Paul Gray, CMO and Community Director, Bubble Gum Interactive, a children’s entertainment and games company, believes we all should take advantage of the knowledge and passion of your early users: “Make it easy for them to give you feedback and thank them for it”. Lisa Frazier, Chief Innovation Officer, Equities and Margin Lending at Commonwealth Bank of Australia, and founder and former President & CEO of The Bay Citizen spoke about the importance of experimenting: “Don’t be shy to try different things,” she said, but never ask your employees to do something you wouldn’t. If you missed the live event, you can still watch it here on YouTube. For those with aspirations to create “the next big thing”, one of the biggest questions is how to grow a product from having just a few users to the hundreds and thousands.